When you are looking forward to your family holiday it is good to know that there will be plenty to keep the little ones occupied. Luckily the Norfolk Broads provides plenty of fun and excitement. Norfolk Broads holidays are a haven for children and families; there is so much enjoyment to be had with the nature and surroundings of the Broads, and there are also lots of attractions designed to entertain and educate children. For more specific locations, all of these attractions are on our Map of the Broads. Moor up at Norfolk Broads Direct boatyard and walk towards the rail station, no more than 10 minutes walk. Prices Child £7.95, Adult £9.95, Under 3’s FREE. £1 off Adult tickets with a relevant leaflet. 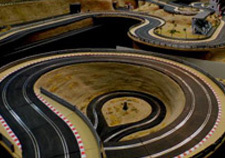 Enjoy wandering around the UK’s largest indoor modelling attraction: model railways, vintage toys, little brick world and much more to see. Moor up at Salhouse Broad then walk up the path to the car park. You will find the pottery at the end of the car park (please note, pottery is not always open). 07704848610. Moor up at Norfolk Broads Direct boatyard, then it’s only a 15 minute walk to the Wroxham BVR Station. This is Norfolk’s longest 15” gauge running between the ancient market town of Aylsham and Wroxham. The train also stops at Brampton, Buxton and Coltishall stations. Moor up in Wroxham, either at Norfolk Broads Direct boatyard or at the Broads Authority moorings at Wroxham Bridge. Take the little boat trip from Granary Staithe by Wroxham Bridge to get to the Railway; it’s only £3 Adult and £1.50 Child which includes entrances and a ride on one of the lines! Two gauges of track available: 3.5” and 7.25” and you can ride in the carriages of both. Watch out though, the railway is only open on the 3rd Sunday of each month from Easter until the end of October. Moor up in Horning village, at the Village Staithe or pubs. 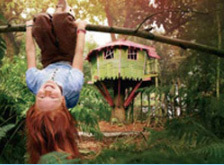 It’s only a 15 minute walk to the Curious Tree house Adventure. Prices are based on height so don’t plant your kids in the tom-grow! On the day £16.50 (over 105cm) £14.50 (92-105cm) Under 92cm visit FREE. Save £1 off the cost per ticket if you book online in advance. Moor up at Reedham Quay then walk to Pettitt’s which shouldn’t take more than 25 minutes. It’s billed as an inexpensive day out offering animals, rides and live entertainment. A family ticket (4 people) is £49, a saving of £5 on individual tickets – buy tickets online to save a further £4! Moor up at Norfolk Broads Direct boatyard. 2.5 miles (approximately 45 minute walk). 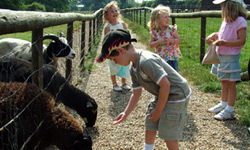 Here you’ll find the Junior Farm – £6.50 per person, under 2’s free, mini golf – Adult £4.20, Under 14’s £3.80, and lots of local produce and craft shops. Moor up at Sutton Staithe then walk across the road and into the village to have a look around this studio established in 1977. Open weekdays from 9:00-13:00 and 14:00-18:00. Phone ahead to double check! 01692 580595. Crazy golf, walk along the promenade, Pleasure Beach, Arcades, Donuts, Great Yarmouth Racecourse for stock cars or greyhound racing. Moor at Stokesby and allow 20 minutes to walk through from Stokesby to Thrigby. It’s more than just wildlife here, you’ll find a swamp house, tigers, primates, red pandas and more! Adult £14.50, Child (4-14) £10.50. The Tiger Tree Walk is a must, although not for the faint hearted as you look down on the big cats! Just let the children out to explore the woods here, next to the moorings and play in the rustic play area. Canoes are also available to hire from £10 per hour (canoes take a maximum of 3 people). Mooring fee applies. If you fancy some live music, try one of the music venues in Norwich. The Waterfront or Norwich Arts Centre are good. There are also plenty of pubs that offer live music in the evenings. Moor up at Norwich Yacht Station. Thursday evenings from April to August starting at 18:00 or 17:30 in August. Bank Holiday times vary. Moor up at the Whitlingham Country Park Broads Authority moorings. You can let the kids off to explore this circular path around Whitlingham Broad. They might even like to try some geocaching. 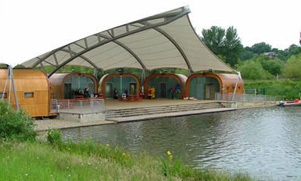 Water based outdoor pursuits are also available from Whitlingham Outdoor Education Centre – 01603 632307. Alternatively, try Norfolk Snowsports Club, moor up and then walk for 10 minutes to the dry ski slope – 01603 662781.